Touch... the dead. Not something you get asked to do on a regular basis. 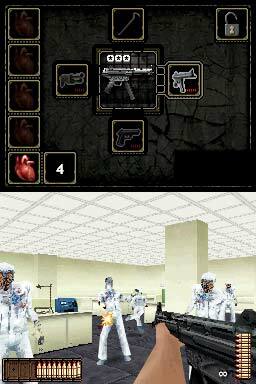 It makes a little more sense when you realize that it's a DS game, and by "Touching" they mean touching with BULLETS! Looks like we got ourselves a good old fashioned House Of The Dead clone! You get to play the part of a man named Robert Steiner, who seems to have woken up in prison, after a presumably hard night on the booze. After finding your cell door open, you make good your escape! Except the place has all gone a bit George A. Romero on you, with your fellow inmates and guards suddenly having cravings for flesh. Your flesh! 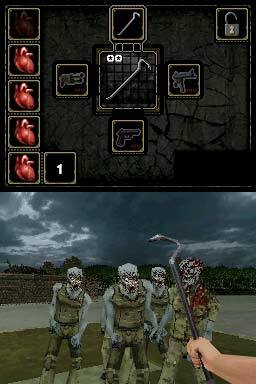 The similarities to the House Of The Dead series don't just end at the presence of zombies, it so happens that the game is an "on rails" shooter. To the uninitiated, that means you don't have any control over the route your character takes throughout the game, aside from the occasional left/right, up/down choice. So while the game might look like a first person shooter, it's anything but. You use the d-pad to change weapons and tapping away on the screen blasts those undead fiends into chunks. Traditionally in these on rails shooters, you reloaded your weapon by firing away from the TV screen. Now they could've simply added a reload button, but that wouldn't be any fun would it? So you have to drag ammo from your storage pouch on the bottom left of the screen into your weapon on the right hand side. The quicker you manage to do it accurately, the more likely that those zombies get a one-way ticket to deathsville... even though... they're... already dead! There's a nice variety of weapons on offer, from crowbars to pistols to shotguns, your traditional zombie dispatching tools. One notable occurrence though is that some of the zombies rip off their own heads, lobbing them at you as a biting projectile. Only thing is, if you remember the words from the scientist in Dawn of the Dead, the only way to kill a zombie is to destroy the brain, or remove the head! So, technically a zombie wouldn't be able to lob his own head at you. Maybe the developers had this discussion amongst themselves, obviously with the conclusion "Yeah, but it's more fun this way!". Visually the game does remind you of the Sega Saturn House Of The Dead albeit set in and around a prison rather than some lunatic scientists stately home. The visuals serve as a reminder that the DS isn't the greatest on the block when it comes to pulling off 3D graphics, but they look like they're going to do their job Ok.
One fun fact nugget is that the game has an alternative title in Europe, the far superior Dead 'n' Furious! As that's something you'd definitely be if you discovered yourself on the wrong side of alive. Touch the Dead launches May 15th in the US. With a date for the European release of Dead 'n' Furious! coming soon.